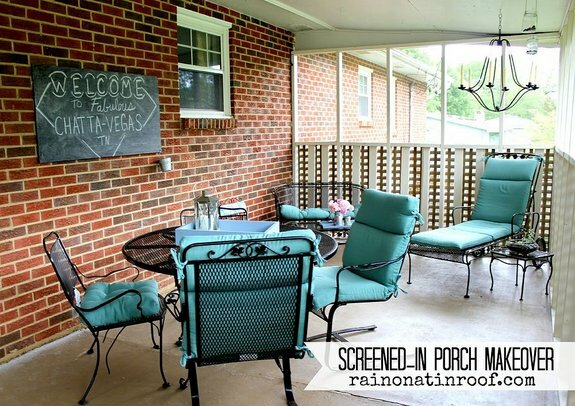 Mary and I hope that these screened in porch ideas give you plenty to think about for planning and furnishing your porch - ideas you maybe hadn't even considered. 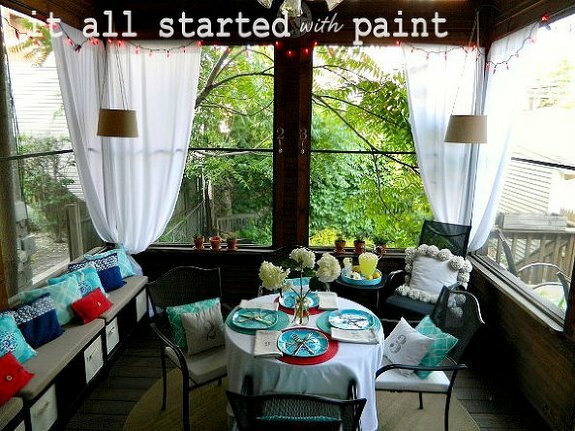 We curated a board on Hometalk with a great batch of DIY ideas for a screened porch. Take a gander to see if any of these screen porch ideas might work at your home. Or perhaps you will just get some inspiration to create your own enjoyable outdoor space. 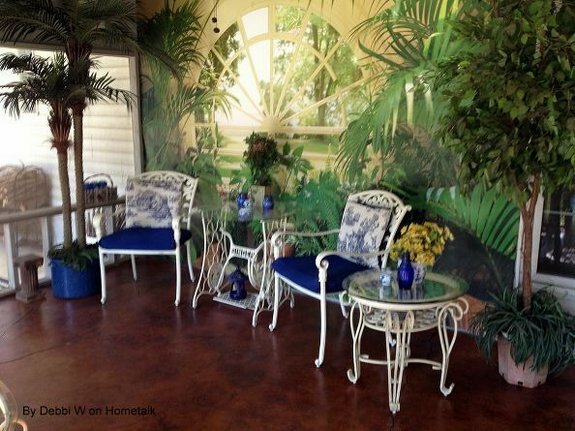 These 19 inspiring screened-in-porch ideas from Hometalk range from building a free-standing screened porch (if you don't have room next to your home) to doing a jazzy makeover to a tip for installing your screens. Hope you enjoy the ideas we chose to highlight here for you! 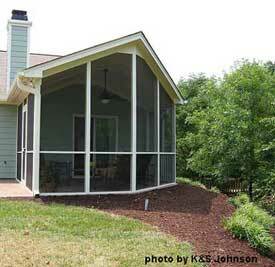 With a seldom-used backyard, the family at Finding Home decided why not add on a screened porch. And that is exactly what they did. Transforming vintage furniture into bright colors and accents, they created a screened-in outdoor space that allows them to eat their meals and enjoy their family on their awesome back porch. 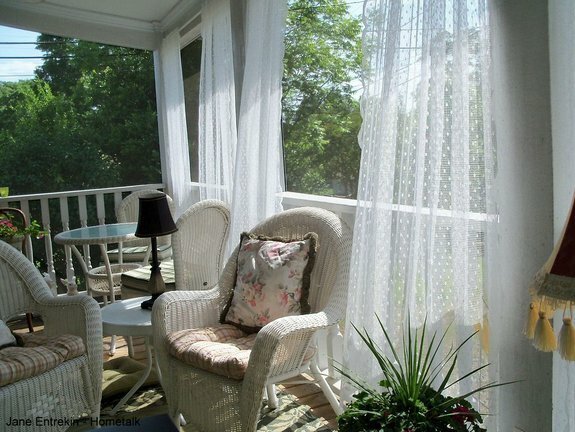 Jane designed the screened porch on the back of her 1925 cottage home. 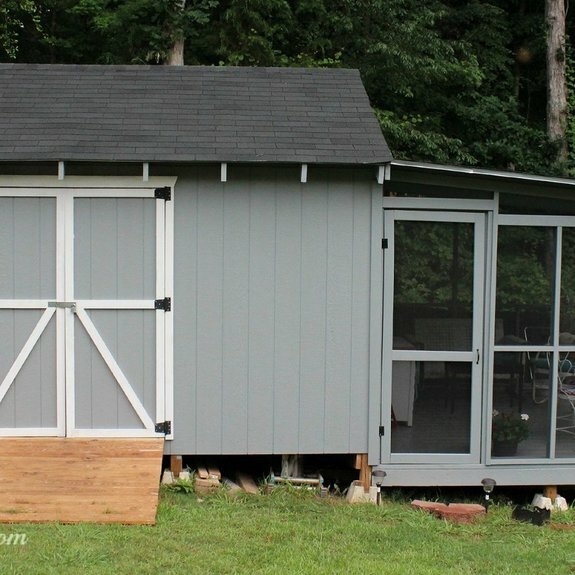 She hired a contractor to build it and kept within budget - under $12,000. 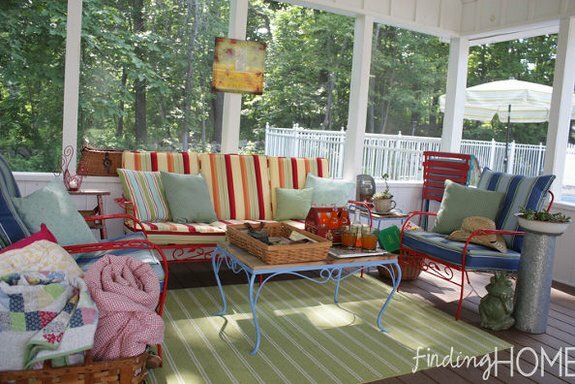 She re-purposed some furniture, fabric and wicker (oh and porch railings, too) to create a dreamy space to enjoy nature. The porch adds an extra 200 square feet of outdoor space. (10 x 20) See more pictures of Jane's porch here. Screened in Porch Idea for Your Screening: Install your screening in sections. Jane's porch screening is well designed so that if a tear occurs, she only needs to replace that section of the screen. Take a look at the lattice that Jenna (Rain on a Tin Roof) added to their screened porch to keep their dogs from ruining the screen. That's a great idea. Pet screening would also work. Their furniture was given to them by her grandparents - a sentimental treasure to keep and enjoy. Jenna says they invested in some modest cushions. We love the bold blue color and comfy style. Or you could opt to recover your older cushions. We read that she also has an old clock on her porch which is always set to five o'clock. Is that happy hour? Debbi's husband stained their concrete porch and the after is quite impressive. This is a DIY project but does take some care and prep work for sure. Debbi commented on Hometalk that it is labor intensive and quite messy; however doing it yourself can save a lot of money. She also commented about the obvious fact that concrete cracks. So they included expansion cracks to allow for that. See more details of Debbi's concrete floor. 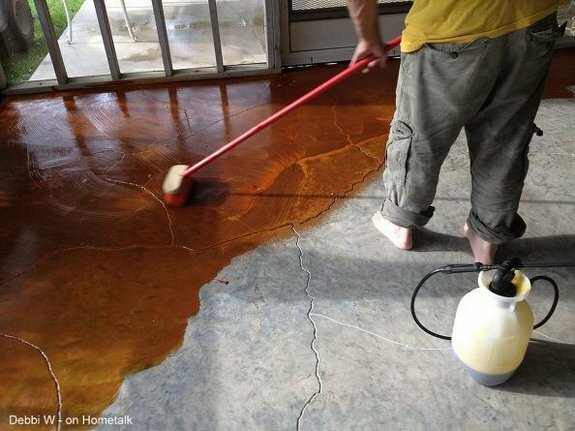 We also welcome you to explore more tips for staining your concrete floors. Mix and match whatever red, white and blue accessories you have. The more eclectic the more fun. We like how Linda mixed the turquoise and royal blue along with bright red and fresh white - It All Stated with Paint. If you don't have the space for a screened porch attached to your home, why not add it on to your garage or storage area. Even a free standing porch might work for you. Thanks to Dawn at We Call It Junkin for sharing this idea on Hometalk. Often we build a screen porch because we just need the space or want to be able to enjoy the outdoors without being bombarded by mosquitos. Both are very good screened in porch ideas. But, really you can have so much more than that. No matter the size, from a small privacy porch off a bedroom to large porch enclosures, knowing how you will use your porch is important. Why? Because knowing the amenities and features you want, your porch's design and construction requirements can be planned out. 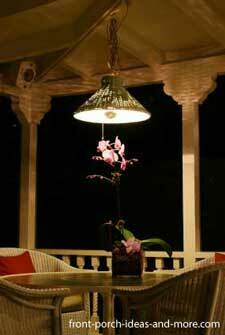 Designing a screened porch for intimate dinners or Friday night pizza parties may require electrical modifications for a chandelier and outdoor fan. Built-in storage is convenient for paper plates, napkins, glasses, books and board games. An exercise room might require in-floor receptacles to power treadmills, a stair climber or elliptical machines. The floor may need to be reinforced for weights or other heavy pieces of workout equipment. An office area may require additional direct lighting, computer surge protection, and tile flooring on which to easily maneuver an office chair. A screened porch designed as an entertainment or game room may require a fireplace and wide-screen TV, stereo surround sound, plumbing for a wet bar, additional electrical outlets, and even a popcorn machine! A built-in wine rack or beverage cooler might be nice. Design for the best view. Wire for outdoor ceiling fans and soft lighting. 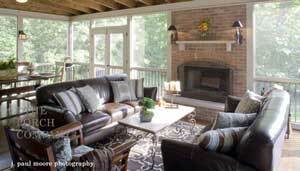 Install an outdoor fireplace and porch curtains. How Many People Will Use Your Porch? Knowing how many people will be using your porch along with its primary purpose will help ensure you build it to the right size. Our advice? Build your porch as large as your budget and space allow. What's the maximum number of people that will use your porch regularly? You will probably furnish your screened porch based on this number. If it will be used primarily by family members on a regular basis you will want to plan for that number plus 2 more (occasional friends). What is the highest number of people that will use your porch occasionally? If you host Thanksgiving dinner every year on your porch, consider adding space or reconfiguring your seating for a larger number. Have additional outlets on the wall for food warmers and a place to stack additional chairs. How young are those that will use the porch regularly? A super screened in porch idea for parents of toddlers and pet owners: You may want a heavier type of porch screening or a knee wall instead of screens near the floor (for safety and protection).